I made this cake for Nicole's 30th birthday last month. We had the grandparents over for birthday cake after we went out for a delicious brunch at xocolatz. This cake was a hit with everyone. This is a combination of recipes. 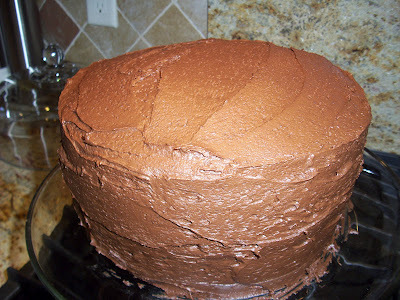 The chocolate cake and chocolate frosting are from http://www.hersheys.com. The vanilla cake layer is from http://www.marthastewart.com. And the strawberry cake layer is from http://annies-eats.com. She made this cake with a strawberry frosting but we are more of a love-everything-chocolate family so I went with chocolate frosting instead. 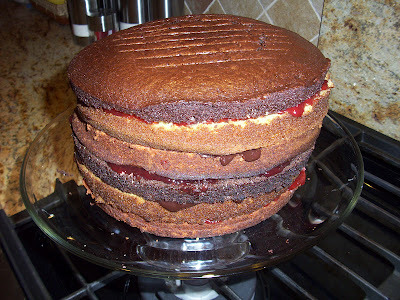 In between the cake layers are alternating fillings of strawberry jam and chocolate ganache. Each original recipe was cut in 1/2 to make only one cake pan of each flavor and then each cake layer was cut it in half. As you can see from the picture the bottom layers get more compressed but still delicious. Make this cake for your next special occasion. Heat oven to 350 degrees and grease and flour one 9" baking pan. Combine dry ingredients in large bowl. Add egg, milk, oil and vanilla. Beat on medium speed for 2 minutes. Stir in boiling water. Batter will be thin. Pour into prepared pan. Bake 30 minutes or until toothpick stuck into center of cake comes out clean. Cool completely. Remove from pan. *to make puree process partially thawed frozen strawberries with a bit of sugar in a blender or food processor until smooth. If using sweetened strawberries, no additional sugar is needed. Preheat oven to 350 degrees and grease and flour one 9" baking pan. In a small bowl combine the flour, baking powder and salt. Whisk to blend and set aside. Combine the sugar, strawberry jello and butter in the bowl of an electric mixer. Beat on medium-high speed until light and fluffy about 2 minutes. Beat the eggs into the sugar mixture one at a time. With the mixer on low speed, add half of the dry ingredients to the batter and mix until incorporated. Blend in milk and vanilla extract. Add remaining dry ingredients, mixing until just incorporated. Blend in the strawberry puree. Pour into prepared pan. Bake for about 35 minutes or until toothpick stuck into the center of the cake comes out clean. Cool completely. Remove from pan. Preheat oven to 350 degrees and grease and flour one 9" baking pan. In a small bowl whisk together the flour, baking powder, baking soda and salt. In a large bowl using an electric mixer beat butter and sugar until light and fluffy. With mixer on low beat in egg and yolks one at a time. Beat in vanilla. Alternate the flour mixture and the buttermilk beginning and ending with the flour mixture. Beat until just combined. Pour into prepared pan. Bake for about 32-35 minutes or until toothpick stuck into the center of the cake comes out clean. Cool completely. Remove from pan. 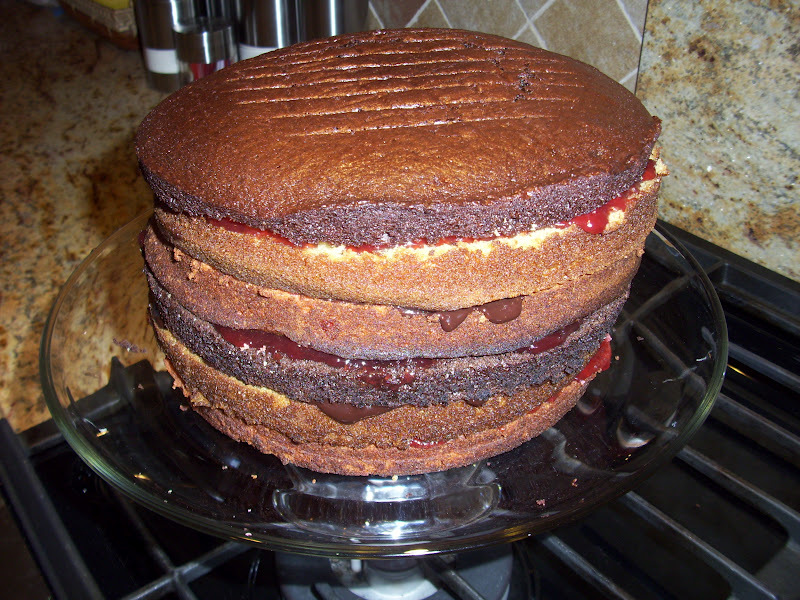 To assemble the cake, cut each cake layer horizontally into two thin layers. Place one of the chocolate layers on a cake platter. Top with a very thin layer of strawberry jam or chocolate ganache. Place a layer of vanilla cake on top. 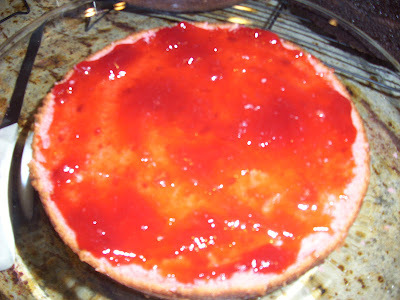 Cover with a thin layer of strawberry jam or chocolate ganache. Place a layer of strawberry cake on top of that. Cover with a thin layer of strawberry jam or chocolate ganache. Repeat the process again with the remaining cake layers. Mix butter and cocoa together. Alternately add powdered sugar and milk beating on medium speed until spreading consistency is reached. Add more milk if needed. Stir in vanilla. Frost top and sides of assembled cake. Thank you for featuring my cake. This looks fabulous! So pretty! Neopolitan ice cream was always my favourite. Thanks for sharing at Scrumptious Sunday! This is a beautiful cake and your recipe looks awesome. Hope you have a great week end and thank you so much for sharing with Full Plate Thursday. This cake is one beautiful cake and we are featuring it on My MEatless Mondays. I am thrilled you shared it with us. I’m out blog hopping today and I'm so glad I found your blog. This cake is beautiful and sounds delicious. I’m a new follower. I host a weekly Creative Thursday link party (runs through Monday nights) and I would love to invite you to share this, and any other posts, on my link party at www.michellestastycreations.blogspot.com. Have a great weekend. That's gorgeous! 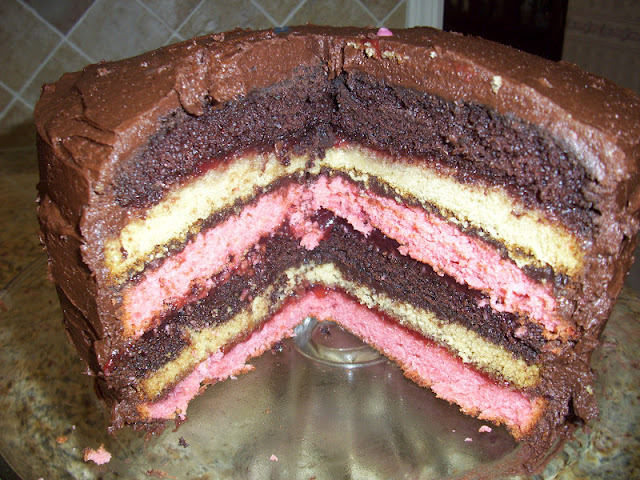 Love all the layers - yum! That is one amazing looking cake!!! I would love a giant slice right now!!! Thank you so much for sharing the awesome cake on Trick or Treat Tuesday!!! Thanks so much for linking this amazing cake up to Creative Thursday link party.